We are focusing some of our design and casting energies on smaller terrestrial creates that arguably take on an extra-terrestrial persona when they are portrayed as larger than life subjects. Beetles and in particular stag beetles have been inspiring awe in Martin Pierce since his early childhood but only now is he able to capture their majesty in bronze. 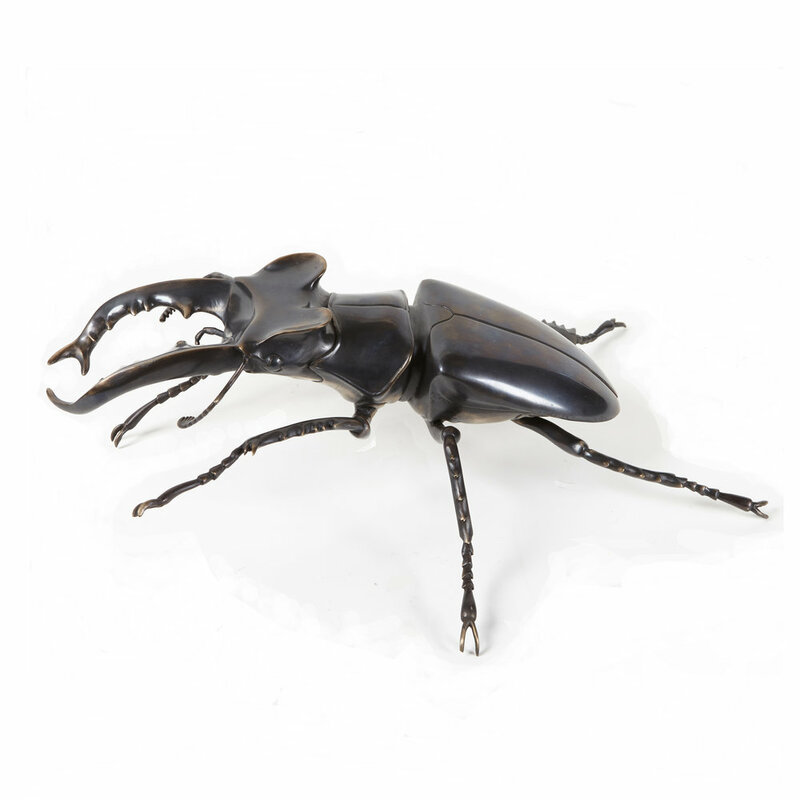 The first sculpture of 2 fighting stag beetles was completed in the late 1970’s when Martin carved a pair in Ebony, a very hard wood that can be polished to a high sheen. Stag beetles are part of the Lucanidae family of beetles of which there are several hundred different types. The stag beetle that Martin saw in England was probably the Lucanus Cervus so named for it’s very large mandibles that clearly reminded early botanists of stag antlers. The stag beetle is aptly named and like the male deer the mandibles are used like antlers to establish male rank and priority in everything from mating to food to territory. The bronze beetles that from part of Martin’s collection of art works were loosely modelled on the Japanese Miyama stag beetle. The original pattern was carved in wood and 5 molds were made for the head, body, left and right legs and antennae. As the 6 legs (3 left,3right) are separate castings this allows Martin some leeway in how he welds and positions the feet and enables him to create a more animated sculpture. The size of the sculpture 20” (from antler to toe) and the polished patina on the bronze metal allow the ridges and indentation of the wing casings and knuckles of the legs and serrated jaw bone to be appreciated as both tactile and visual experiences.